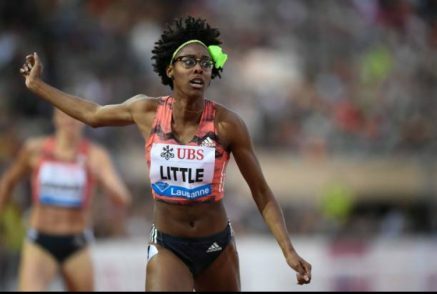 5th July 2018 – Fresh off the back of winning the US national title, Shamier Little (USA) showed she can produce on the world stage too with a hard-fought victory at the IAAF Diamond League meeting in Lausanne. Approaching the final hurdle Shamier was locked together with Jamaican champion Janieve Russell, but her speed and strength off the final barrier was decisive as she edged ahead to take the spoils in 53.41 seconds, her second fastest time ever and the second fastest time in the world this year. Jenna Prandini (USA) came through strongly in the women’s 100m to take third place in 11.00 seconds before neatly hurdling a cameraman just past the finish line! Winny Chebet (KEN) gave her all to take ninth place in the women’s 1500m despite suffering from illness in the proceeding days. At the Guadalajara International meeting in Spain, Kemar Bailey-Cole (JAM) made a good start to his European campaign finishing second in the 100m in a season’s best of 10.12 seconds. Laura Roesler (USA) was just outside her season’s best when taking third place in the 800m in 2:00.92.